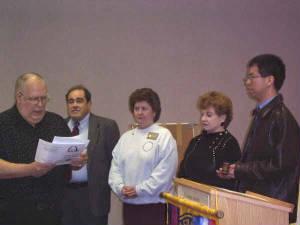 Area Governor Terry Stewart swears in officers (left to right) CTM Bobby Blattman-Sgt-At-Arms, CL Jeanette Owens-Treasurer, TM Ann Gay-Secretary and ATM-B Marcos Chu-VP Public Relations. 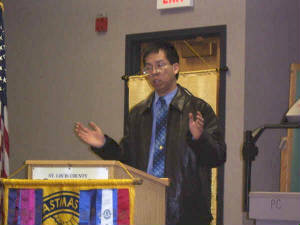 ATM-B Marcos Chu making introductory comments for his "Nanotechnology" presentation. 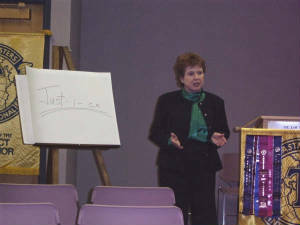 Toastmaster Ann Gay offers a perspective on "Justice". 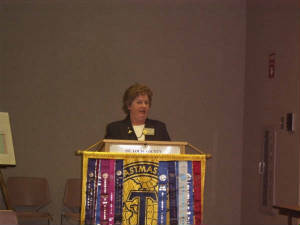 CL Toastmaster Jeanette Owens presents her perspective on "Getting Organized".